Meet Trooper Midgley. 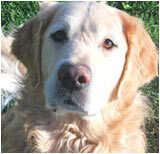 This sweet seven year old Golden is a regular visitor at Staufer Team Real Estate. Owner Jill says Trooper loves pretty much everyone. Trooper misses his Main Street pal Cooper, but always looks forward to meeting new people and pooches. Henry and Josephine Guenzi built this home in 1908 and maintained an association with it until 2012. They were Italian immigrants and were involved with coal mining, dressmaking, and the telephone company. Just a reminder, there is no Street Faire on August 4, in support of First Friday Art Walk. 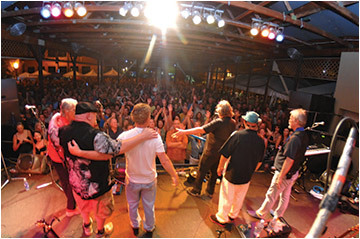 But August 11 is the last Street Faire of the year and it promises to be a good one as we bring back Colorado’s favorite band, Firefall. Their timeless tunes and great musicianship make everybody happy. So join us for a fond farewell to this season’s Street Faire and sing along to familiar songs with a few thousand of your closest friends. 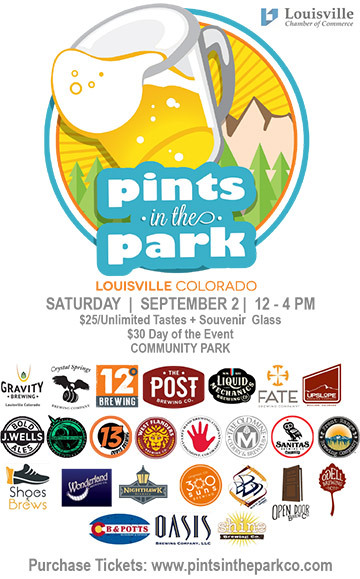 Many thanks to all of our volunteers, sponsors hard-working crew and of course, you the audience, who continue to support the Faire year after year and have made it a cornerstone of the Louisville community. One hundred pieces of fine art and photography have been selected from a field of over 600 that come from Colorado and the US! 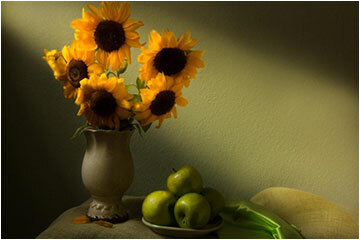 This is a blind selection done by our Judge, Jane Jones, a nationally recognized artist. These pieces will be on display and for sale at the Center for the Arts. Bring your family to any of the events and enjoy this beautiful art collection. Gallery hours and events will be posted on the Louisville Art Association website, louisvilleart.org. Yarn Parties at FingerPlay Studio add play to your office get together, friends night out or celebration. Choose from a list of projects suitable for anyone. Projects range from knitting to crochet to creative weaving and more. Materials and instruction are included. Book a party at your location or at FingerPlay Studio. Call Celeste or Carol at 303-604-4374. The new doors are open, the decor is so “Looish” the menu is bigger and better than ever, and the rooftop deck is still amazing. Get yourselves over to the Waterloo’s bigger digs, just two doors down from the old place. Johnny’s waiting for you. Erin is an experienced yoga teacher with a gentle approach, and has been teaching hypnosis for relaxation since 2011. All students, all levels are welcome. No prior experience required. What to bring: yourself, comfortable clothing, and a yoga mat. The Singing Cook marks five years in business on Aug. 1 and they are celebrating with a host of activities including an Anniversary Sale, Special Art Walk fun and a drawing for Singing Cook prizes! The celebration kicks off, on Art Walk, August 4, with cake, bubbly and singing. Then, enjoy 20% off store merchandise, August 4 – 6, and up to 50% off clearance and enter an Anniversary Drawing to win one of three special prizes! Jenni at Singing Cook, says “thanks to everyone who has helped keep us in business for 5 Years and cheers to more years to come!” And to you Jenni, we say, thanks for bringing all the uniqueness and charm of your store to our downtown community. Happy Anniversary! The Rocky Mountain Hyperbaric Association will holds its 9th Annual Fondue Dinner fundraiser at the Melting Pot. 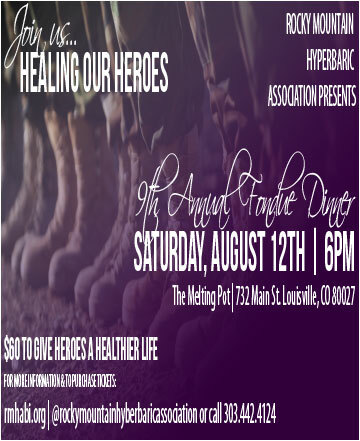 The event is designed to raise money to help the Healing our Heroes program and costs $60 per person. The Healing Our Heroes program supports veterans of Operation Enduring Freedom and Operation Iraqi Freedom, first responders and fire fighters with brain injuries by assisting with payments for hyperbaric oxygen therapy treatments as well as providing lodging for those veterans who will be traveling to Louisville for treatments. 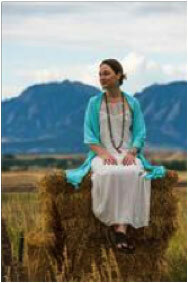 For further information or to register for the event, visit rmhabi.org or call 303-442-4124. When should I start collecting? What if I'm divorced? Will the funding last? Where can I learn more? How will my choice affect my taxes? 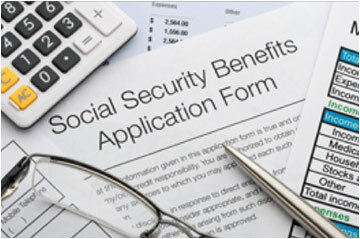 Can I get PERA and Social Security benefits? Get the answers to these and many other common questions to help you make informed decisions about your benefit options. Money Matters features a different topic each month.